Back in July, I was contacted by OMG Nail Strips asking if I'd be interested in checking out a set of their nail strips. I am not the hugest fan of nail strips for me - I just like getting to paint my own nails - BUT - I do understand the greatness of nail strips.. Plus, after I scoped their website, there were a few that interested me. I had my pal Yaz help me narrow it down to the Peacock Nail Polish Strips.. because.. I need to be real here: I can't replicate that exact design on my nails. I will say these are probably the easiest nail strips I have used application wise.. Or maybe it is because I have applied strips a time or five - but seriously, I applied one fairly crooked at one point, and was able to lift it off and reapply with zero problems. I liked that a lot! I also really liked how easy they were to remove.. I seriously only swiped over a time or three with some nail polish remover.. I expected to be putting in some serious work to remove them like I have with other strips I have tried in the past. I feel there are also quite a few unique options - which is always a plus. 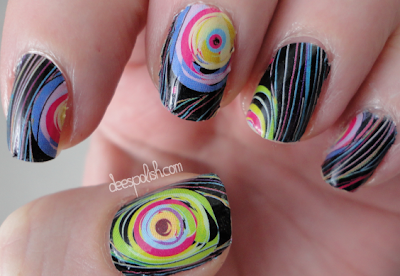 I figure if you're going to use nail stickers, go for some serious activity.. otherwise.. well.. what is the point? My only real dislike on these strips - and I have to say this about polish strips in general - they never are close to fitting my nails. I always have to cut them to make them sort of fit. I either have baby nails or just weird nails in general. I haven't really decided my issue yet. I sort of think my nails look a little rough in these photos.. but I don't recall them looking so strange in real life. Dangit photos! 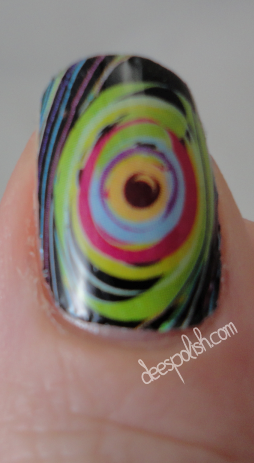 I did really, really like this design though - particularly strip I used on my thumb! That is the one strip that I didn't have to doctor (re: cut) as much as the others. Plus it uses a wealth of green.. makes sense it would be my favourite. You can scope out all of the rad nail stickers by clicking HERE annnd there is currently a little promo going on.. You get any 4 set of strips for $20 if you use the code 4pack - how awesome is that?! If you're a little wary on how to apply these strips - you can check out this link HERE and it will give you all the application information. You can also scope out this LINK... There is a new giveaway every month.. which is pretty awesome!